In Haiti, approximately half the population lives without access to clean, safe water. Contaminated drinking water makes people sick, affects their ability to work, and can even be fatal. For children, especially babies and children under age five, contaminated drinking water is especially dangerous. These diseases also often lead to acute malnutrition, particularly in children, which can lead to permanent health problems, developmental delays, and increased mortality. The World Health Organization and UNICEF estimate that for children under age five, water-related diseases are the leading cause of death, and further, that about 45 percent of all child deaths are linked to malnutrition. Access to clean, safe water is therefore essential to protecting the lives of infants and young children, in Haiti and around the world. To help minimize the incidence and spread of waterborne infectious diseases– one of the most serious public health threats in Haiti– HAS focuses heavily on providing access to clean water through well-building programs in communities that make an official commitment to maintain them with training provided by HAS experts. More than 120,000 of the 350,000 people in our service territory now have access to safe drinking water because of these programs. HAS also installs simple “Tippy Tap” faucets for hand washing, and provides hygiene education to ensure that families understand the importance of good hygiene in preventing disease. The rural Lower Artibonite Valley, where HAS is located, is a watershed region of Haiti that is economically, agriculturally, and environmentally significant to the entire country. The Artibonite River watershed system is important to both Haiti and the Dominican Republic. 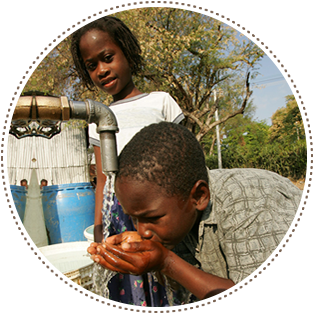 HAS has brought clean water in the form of wells, capped springs, cisterns, and water filters to hundreds of thousands of people in the past half century. We have also provided thousands of hours of education on sanitation and hygiene—a critical, though sometimes forgotten step in the fight against deadly waterborne microbes and contaminants. Through programs that build wells, cap springs, and construct cisterns, HAS works closely with communities to create access to clean water. Communities must make an official commitment to invest in and maintain these projects, with HAS providing critical start-up support and ongoing training. The positive impact of this community-focused approach is clear. In the past 15 years alone, because of these programs, more than 120,000 of the 350,000 people in the hospital’s service area have gained access to potable drinking water. In the last several years, HAS has helped to install many simple but effective Tippy Tap hand washing stations, accompanied by hygiene education, so families understand how hand washing saves lives. These projects are positively impacting public health and improving the overall quality of life for families and communities. 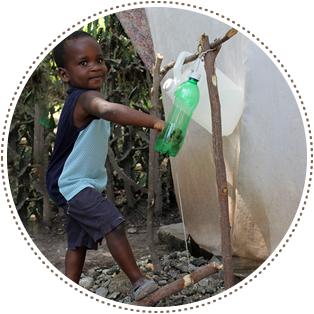 You can help bring clean water and hygiene education to more Haitian communities. A gift of $308 buys all materials needed for HAS water and sanitation activities for a day. Copyright 2019 Hôpital Albert Schweitzer Haiti. All Rights Reserved. 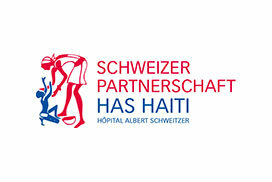 Schweizer Partnerschaft Hôpital Albert Schweitzer Haiti (SPHASH): Based in the Graubunden region of Eastern Switzerland, but active throughout Switzerland, SPHASH has recruited dozens of medical and technical personnel for HAS since 1997, financed several laboratory, ultrasound and other machines and has encouraged the long-term volunteer service of a number of clinicians. Following the horrific earthquake several significant projects for immediate support were started by large SPHASH fundraising activities in Switzerland and Germany. Important long-term projects of SPHASH are the financing of the Pediatric Service (Swiss Pediatric Program) running costs and the Social Service for indigent patients. In 2011 SPHASH renovated the HAS Laboratory and initiated Microbiology by providing a teaching Microbiologist, machines and material. SPHASH set up the Surgical Project with the purpose of improving Trauma Surgery and Anesthesia at HAS as well as sending Swiss Surgeons and Anesthetists to cooperate and train Haitian physicians, in collaboration with Swiss University Hospitals. New projects include a large Solar Project for electricity supply by solar power. SPHASH collaborates with other Swiss governmental and non-governmental organizations.